How does the double rotating hydropower screw with the Albrecht fishLift inside work? The hydropower screw with double rotating cylinders is based on the functional principle of a hydropower screw. There is an outer sheath with a headrace screw that contains an inner, counter-rotating, spiral fish transport screw, which pumps water into the headwater based on Archimedes’ Principle. Power generation is made possible by a drum (rotating cylinder) with a casing pipe that is seamlessly welded to the screw blades. In contrast to conventional hydrodynamic screws, the Hydroconnect hydrodynamic screw is mounted by means of the patented belt capstan or rolls on the outer shell. The flow of water from the exiting headrace and the central luring current are used to guide fish wanting to reach the upper level to the inner fish lift. As soon as they swim into the entrance, which reaches down as far as the river bed, they are transported gently upwards in the constantly filling water. The fish end up at the upper level via a fish discharge chute. The water transported to this upper level is ready once again for reuse by the plant or alternatively for the fish to make their way down. What benefits are offered by the Hydroconnect double rotating hydropower screw with integrated fish lift? Besides efficient, fish-friendly electricity production, the double rotating hydropower screw makes it possible for fish to ascend and descend. Through the compact design, it is possible to install cost-effectively, even at existing hydropower plants and other transverse structures. More about this at benefits. How high is the efficiency of the Hydroconnect hydropower screw with double rotating cylinders? The mechanical efficiency is up to 90%. This results in electrical efficiency, minus all the mechanical losses, of 65% even for small systems. In larger systems, the electrical efficiency increases to 70% and more. For what designated uses and head is the Hydroconnect hydropower screw suitable? The Hydroconnect hydropower screw is suitable for injury-free fish migration with simultaneous electricity generation. In the process it can handle the following quantities of water: 0.3 m³/s to 4.5 m³/s and heads of 2 to max. 20 m (even higher if necessary; in cascade system). The capstan makes the hydropower screw practically independent of the supply and head. How fast does the Hydroconnect double rotating hydropower screw turn per minute? Hydroconnects hydropower screws turn with a fish-friendly and efficient speed between 2 and 20 rounds per minute. Due to the implemented frequency converter technology, different rotational speeds are possible depending on the water flow or desired supply. Our tests have shown that fish ladders can work at a great variety of speeds. The fish adapt very well to the dynamic conditions. With what water supply does the system work for electricity generation and fish migration? How is the double rotating hydropower screw with fish lift mounted? We decided against the conventional use of underwater mounting for emission-related reasons (no grease can get into the water). The entire mass is mounted by means of heavy duty belts or rolls. This is one of HYDROCONNECT’S EU-wide patents. The belts are manufactured explicitly for the required tonnage of the machine. The number of belts or rolls is determined by the total system length. The grease-lubricated guide mount in the above-water area also runs in dry air and is calculated using a long-lasting design. What has to be observed regarding the mount (type, lubrication, maintenance, service life, lubrication in the water)? Hydroconnect uses different types of ball bearings for the belt or roll mount. What is the service life of a hydropower screw with double rotating cylinders? The HYDROCONNECT double rotating hydropower screw is calculated for fatigue strength. The selected corrosion allowance with the choice and thickness of material ensures a minimum service life of 30 years. What structure situation does the hydropower screw with fish lift inside require? (self-supporting trough on feet - trough back-concreted)? The hydrodynamic screw is placed in a U-shaped concrete structure. The space that is required is determined as follows: screw diameter + inside clearance 1000 mm total (i.e. 500 mm per side). See drawing. Protection in the bottom water area is a good idea, because that way the system can be drained in the event of high water and for maintenance work. Is a trash board necessary? A trash board is not necessary, because foliage and floating debris can pass through the screw. Is a fine screen necessary in the headwater inlet of the double rotating hydropower screw? Due to the fact that all water life can pass through the system, fine screens are not necessary. Usually a coarse screen with bar spacing of at least 3x the width of the predominant fish species is useful and necessary. Can the hydropower screw with double rotating cylinders from Hydroconnect also be used as an adaption to existing power plants/turbines? Yes. The Hydroconnect hydropower screw can be used as an adaption to existing situations as a fish lift and/or residual water machine or for smaller situations (currently displacements of up to 4,5m3/s can be handled) as a complete replacement for a turbine. Do you offer different drum sizes? Yes, the system will be adapted on-site specifically to your location or alternatively your conditions, depending on the head, water supply and the predominant fish species and its size. Are there any devices for protection against high water? The structure is designed for the desired HQ mark (e.g. 30, 50, 100). By means of the intake gate and corresponding outlet gate, the entire structure can be protected against high water or alternatively it can be sealed watertight. The gearbox, generator and equipment cabinet are preferably planned to be above the HQ100 line (situation dependent). Is operation possible with high water and a high volume of floating debris? It is generally possible to operate the Hydroconnect hydrodynamic screw until the bottom water reaches its limit. Then a shutdown is required. Generally, hydrodynamic screws are quite resilient to dirt. Therefore, floating debris is not a problem. Larger trees or pieces of wood will be kept back by the coarse screen in the headwater area. How much space must be provided to install a Hydroconnect hydropower screw? In contrast to conventional systems, the system from Hydroconnect is very space-saving. With conventional systems, a slot pass or a close to natural pool pass including a connected (residual water) screw/turbine has to be installed. The Hydroconnect hydropower screw provides the fish ascent, fish descent and use of the residual water for energy in one. What safety systems are there? How can a possible removal of the hydropower screw be handled (shaft repair or the like)? As a rule, no damage to the hydrodynamic screw is to be expected, because hazards such as large logs are held back by the coarse screen. Everything else can pass through the screw and will not damage the 6-10 mm thick steel plate (depending on the system size). Can logs, branches or alternatively various floating debris become trapped in the screw? No, trapping of branches or floating debris is extremely unlikely, because there are no constrictions or bottlenecks in the screw. Do power plant operators receive environmental funding for the installation of the fish-friendly Hydroconnect hydropower screw? There has not been a budget for funding fish ladders in Austria since March 2014. Before that, operators were able to request funding from the KPC (Kommunalkredit). The Hydroconnect hydropower screw system was classified as eligible for funding. Individual funding possibilities vary from state to state. Do power plant operators receive energy industry funding for this system? Yes, there is the possibility of applying for investment as well as electricity rate funding from the individual states, KPC Kommunalkredit or OeMAG Abwicklungsstelle für Ökostrom AG. That way, the electricity-producing fish bypass will pay for itself much faster. How can I get a Hydroconnect hydropower screw? The best thing is to contact your product account manager Nino Struska. He would be happy to answer your questions and help you during the planning and realisation. 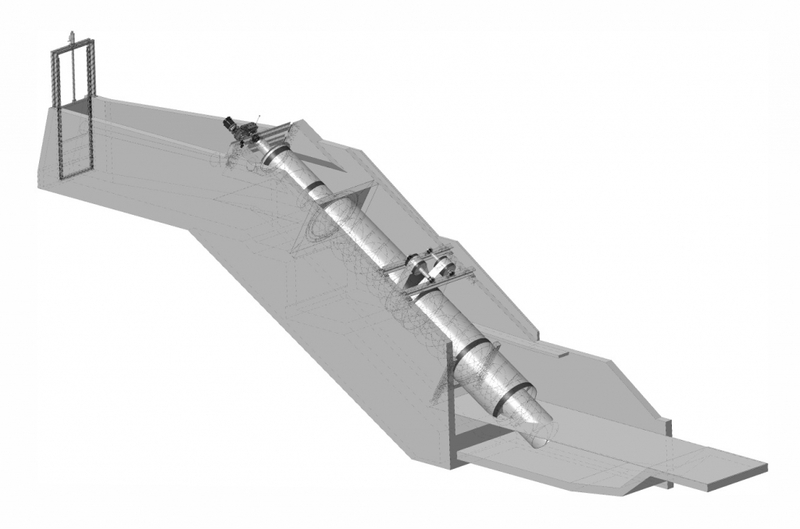 How is the fish-friendly hydropower screw transported and assembled? A truck and a heavy-duty crane provided by the customer are used for transport to your location. We at Hydroconnect take care of the clarification of the formalities and the transport. The assembly is handled by our own team as is the preparation of the control and signalling system. How exactly is the trough (structure) of the hydropower screw with double rotating cylinders supposed to be built? It would be advisable to also make use of the outgoing turbine water currents as a luring current for the fish ladder (= on the turbine side). How long does it take for my Hydroconnect hydropower screw to generate electricity and transport fish? Is the Hydroconnect hydropower screw suitable for all fish, or more precisely will the fish in our waters fit through the screw tube? Why does the Hydroconnect hydropower screw with double rotating cylinders with the Albrecht fishLift inside guarantee 100% freedom from injury for fish and microorganisms? No, the hydrodynamic screw with double rotating cylinders is for the passage of the strongest and weakest swimming species of fish at all stages of life. For more details, go to Studies.